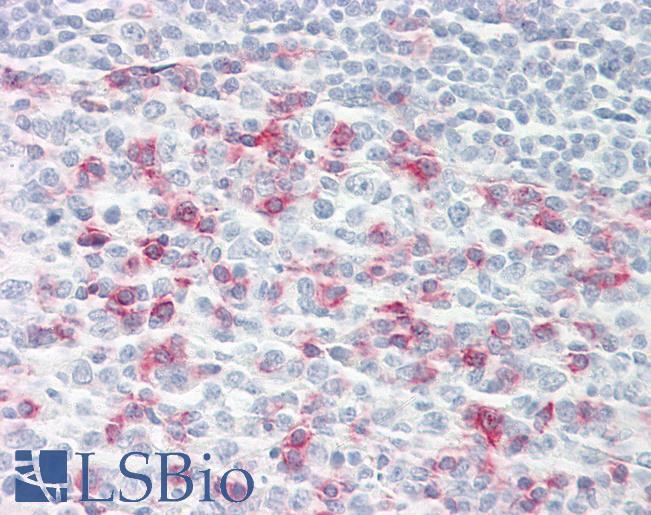 PD-1 antibody LS-B7883 is an unconjugated mouse monoclonal antibody to human PD-1 (PDCD1 / CD279). Validated for Flow, IHC, IP and WB. Tested on 20 paraffin-embedded human tissues. The J116 antibody has been tested by flow cytometric analysis of human PD-1 transfected cells. This can be used at less than or equal to 1 ug per test. A test is defined as the amount (ug) of antibody that will stain a cell sample in a final volume of 100 ul. Cell number should be determined empirically but can range from 10^5 to 10^8 cells/test. It is recommended that the antibody be carefully titrated for optimal performance in the assay of interest. 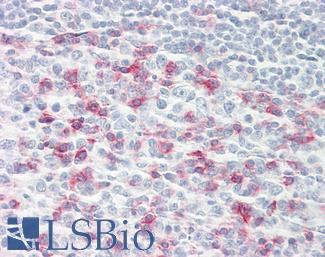 Anti-CD279 / PD-1 antibody IHC of human tonsil. Immunohistochemistry of formalin-fixed, paraffin-embedded tissue after heat-induced antigen retrieval. 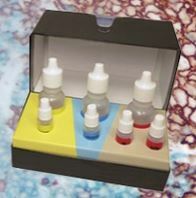 Antibody dilution 20 ug/ml. Surface staining of human PD-1 transfected cells with anti-human PD-1 (J116) FITC. Appropriate isotype controls were used (open histogram). Total viable cells were used for analysis. Surface staining of PE. Appropriate isotype controls were used (open histogram). Total viable cells were used for analysis.